Dr Fabio Freddi has been awarded a collaborative, international research grant to develop the 'Hybrid Testing of an Existing Steel Frame with Infills under Multiple Earthquakes' (HITFRAMES). The EPICentre team collaborating within the HITFRAMES project is composted by Dr Freddi and Fernando Gutierrez Urzua and is also supported by Dr Carmine Galasso and Dr Arash Nassirpour. The project team is constituted by researchers from UCL (UK), University of Liverpool (UK), University of Naples Federico II (Italy), University of Ljubljana (Slovenia) and University of Toronto (Canada). The project is also supported by an industrial partner: FIP Industrial S.p.a. (Italy).In addition, the experimental results will allow to calibrate numerical models for the tested frame. The numerical analysis will allow to investigate the vulnerability of the system, the effectiveness of the retrofit method and the influence of the infills. 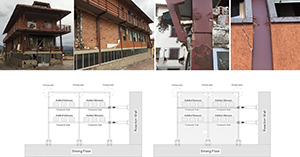 The study will comprise probabilistic studies and hence the derivation of fragility curves for steel frames with infills and systems retrofitted with BRBs.The project includes an experimental phase in which steel moment resisting frames with masonry infills and BRBs will be tested. The experimental campaign includes tests on the bare frame and on the retrofitted frames up to collapse. The effect of earthquake sequences will be also experimentally evaluated. The experiments will be carried out atSTRULAB at the University of Patras, Greece.HITFRAMES project focus on the development of reliable methods for the seismic assessment of existing steel frames under multiple earthquakes, the evaluation and development of design procedures for buckling restrained braces (BRBs) considering also the contribution of the infills. The research is being funded by the 'Seismology and Earthquake Engineering Research Infrastructure Alliance for Europe' (SERA), based on the priorities identified in the Horizon 2020 call 'H2020-INFRAIA-2016-2017'. The main goal of SERA is to improve the access to data, services and research infrastructure, and to deliver solutions based on innovative R&D in seismology and earthquake engineering, aiming at reducing the exposure of our society to the risk posed by natural and anthropogenic earthquakes.